Set consists of five (5) pairs of reusable AED training electrode pads. 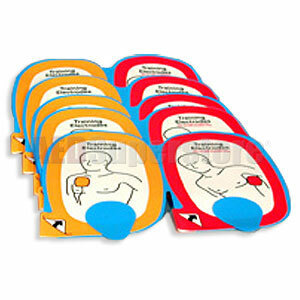 The reusable AED training electrode pads are good for approximately 30 applications. Plastic electrode pads conduct no energy. Cable/connector assembly and reusable foil pouch sold separately (11250-000012). Thanks for once again being so fast in filling my order. These training electrode pads are great, & can actually be used more times than the instructions indicate, so they are cost effective.